Taking time during our busy daily lives to stop and appreciate the present can be like pressing a "pause" button. Most people - teenagers and adults - have experienced feelings of stress or difficulty at some point in their lives. Sometimes we can get very caught up in thoughts about the past, or worries about the future, and feel overwhelmed by all the stuff circling around our brains. Mindfulness training helps us to re-connect with the present moment. We gradually learn to tune in to our breathing and our body, and become aware of the thoughts and emotions in our heart and mind. Having a moment to step back from the stress and difficulty can mean we calm ourselves. When we are ready to reconnect with daily life again, we return fresher and with new eyes: we are able to gain more space and perspective on what's difficult, while appreciating moments of joy more too. 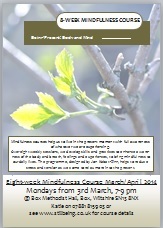 The eight-week mindfulness courses for adults (MBSR) and teenagers (.b) take the form of weekly group sessions. These sessions deliver the skills and approaches that help us to become more present in our lives.